Single clones of antigen-specific, H-2-restrieted helper T cells have been found to produce a variety of lymphokines and hematopoietic factors when stimulated by antigen and adherent cells. These include factors which are active on lymphoid cells, i.e., T cell growth factor (TCGF) (1), B cell growth and maturation factor (BRMF) (2), and T cell replacing factor (TRF) (3). Various colony-stimulating activities (CSF) have been shown to stimulate proliferation of hematopoietic precursor cells. Such activities have also been described previously in supernatants from spleen cells stimulated with either mitogen (4,5) or antigen (6) or from the WEHI-3 macrophage cell line (7,8). The hybridoma technique can immortalize this capacity of normal T cells (9). 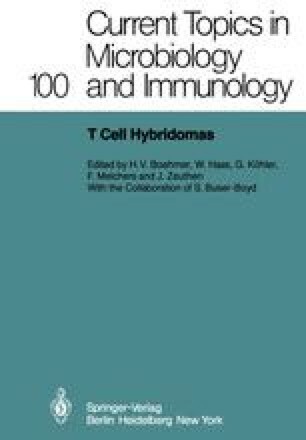 T cell hybridomas offer advantages as a defined source of material for biochemical and genetic analysis of these different growth factors. It would, however, seem advantageous to have T cell hybridomas which produce only a single factor in order to determine their structure and to distinguish their activity with normal populations of cells from other activities with the same cell populations. I have therefore studied T cell hybridomas with different specificities from different fusion events as well as a series of reclones of a single T cell hybridoma. Of BRMF activities only the LPS blast-replicating activity has been determined, called B cell growth factor (BCGF) in the following. While the relative and absolute amounts of TCGF and BCGF vary even between different reclones of the same cloned T cell hybridoma I have not yet found a hybridoma producing only one activity.